Here is our Atari Punk Console in Eurorack and Fractional Rack form! Originally designed by DIY electronics guru Forrest Mims III as the “Stepped Tone Generator”, the Atari Punk Console is one of the most famous and recognizable Lo-Fi synth circuits ever. Using a single 556 dual timer IC with minimal part count, the Atari Punk Console circuit is a solid, time-tested noise generator capable of outrageous square wave madness! Low part count = easy build for beginners! Control Voltage (CV) input allows step sequencers and waveform generators to expand the sonic capabilities of the Atari Punk Console from drone to arpeggio-like dynamism. Use any variable voltage source from 0-Supply Voltage for some glitchy goodness! 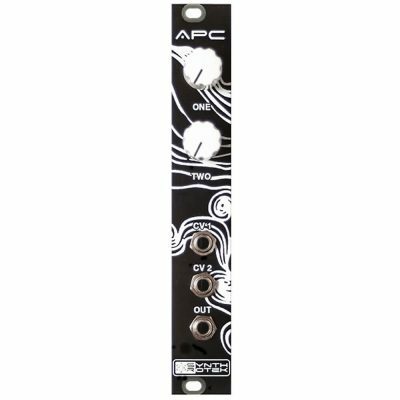 The APC modular version has two CV inputs that modulate the two square wave internal oscillators. 2 potentiometer controls – Pulse Width and Frequency contour the tone. Looking for those hard to find Audio Jacks used in this circuit? You can buy them directly from us! Click here for the Rack Based APC audio Jacks! Hello, does Synthrotek offer step sequencers and wave form generators that would work in conjunction with the APC? The frequency on my APC goes down as I turn the “One” knob up, also when CV value rises, frequency goes down. Is that normal behavior, or did I mess up my build? When the CV input goes up in voltage, the frequency is supposed to go down, so that is normal. However, when you turn the knob labeled ‘One’ clock-ways, the frequency should go up as well. I would double check all the components around that potentiometer for anything that looks weird. Feel free to also send an email to store@synthrotek.com for support.